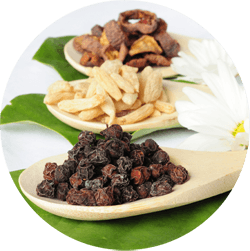 TCM Herbal Therapy is the practise of prescribing herbal formulations, based on the theories and principles of Traditional Chinese Medicine (TCM), to address individual conditions of disharmony in the body. Like acupuncture, it traces its roots far back into history, with ancient texts dating from around the 1st century BCE describing its use. Some of these original formulations, being thousands of years old, are still in use today. 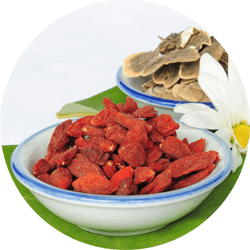 A TCM herbal formulation is a recipe of several herbal ingredients that work synergistically to address a health concern. The formulations are chosen and designed to meet specific needs of an individual, based on what their particular body conditions may be. This means that in five different people having the same chief complaint, five different herbal formulations may be prescribed. Thought is given to both the problem at hand, as well as the distinctive characteristics of an individual’s constitution. The older, and still extremely effective, method of taking these prescriptions was to boil a decoction of the raw herbs down to a few cups of liquid that could be consumed a few times a day. Nowadays, (mostly for sake of convenience), they are mostly administered as a powder that can be reconstituted with water to form a tea, or they can be taken as a tincture or in pill form. 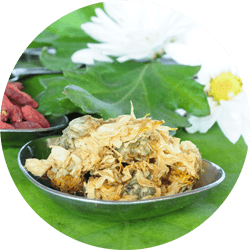 TCM Herbal Therapy is only practised in British Columbia by professionals who are licensed to do so (having met certain requirements and passed government licensing exams), and Chinese Herbals are overseen by Health Canada in the Natural Health Products Regulations. Applicable to a wide range of health concerns, the suitability of using herbal therapy for your unique health needs is best discussed on an individual basis with your licensed practitioner.